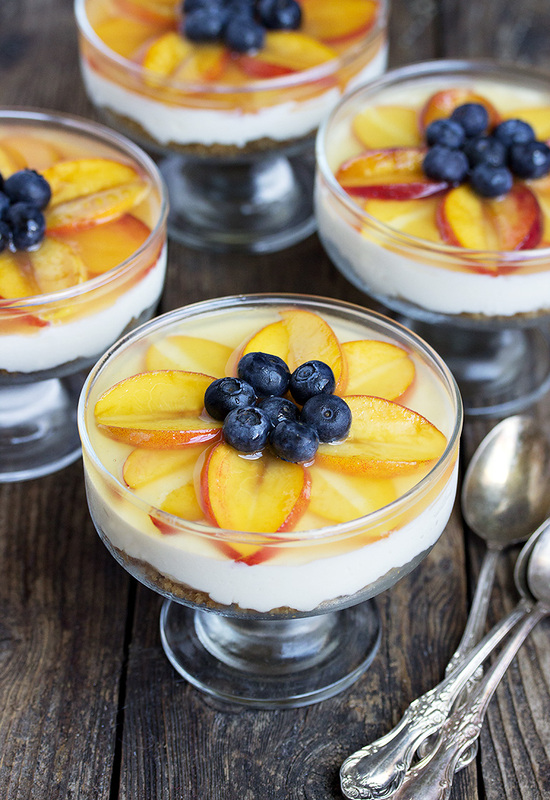 These delicious No-Bake Peach Cheesecake Cups have a pretty fresh peach and blueberry “sunflower” top, with easy no-bake cheesecake filling. Great for summer entertaining! 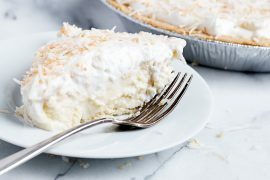 Being as it’s the hottest part of the summer, I really wanted to make a dessert with no oven involved. And of course, it’s peach season, so peaches were a must. Blueberries, too, for that matter. And since I am a little sunflower obsessed at the moment … well, these little cups were born. I’m not sure how well it shows in the photos, but there is a glaze that is poured over the top of the peaches, that sets up in the fridge. It also really slows down the browning of the peaches, so these can definitely be made well ahead and will keep well in the fridge. The peaches will eventually start to show their age a bit, but will still be delicious. If you’re entertaining, you can make these mid-day and refrigerate until dinner without problem. I like to cover these with foil if they will sit in the fridge for a while. Foil works best, as it is stiff and won’t droop in to the glaze. This will help keep them fresher longer and keep fridge odours out. Put the foil on after they have been in the fridge for an hour, so that the glaze has had a chance to set up. When I made these, I didn’t make enough glaze the first time, so had to make another batch. For the second batch, I used some peaches that had skin on, not thinking it would matter much as I was going to be straining it out. It didn’t matter for the taste, but it did give the glaze a definite rosy tint. You can probably see that in the photos. If you like that, leave the skins on. I kind of liked the look of the more clear glaze, myself, but your call. I found this glassware at a Thrift store, so that’s a great place to look if you don’t have cups already that will work. The cups are 4 1/4 inches in diameter and about 1 1/2 inches deep. The glass is nice to show the layers, but if you don’t have anything glass that will work, a white ramekin of about the same dimensions would work just fine. 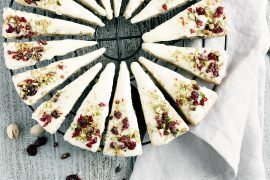 A delicious, easy and pretty dessert, perfect for summer entertaining or a special summer treat. For the Glaze: In a small-medium saucepan, combine the crushed peaches, sugar, cornstarch and cold water. Stir to combine. Cook over medium heat, stirring regularly, until mixture comes to a boil. Reduce heat to low and cook another couple of minutes until liquid looks clear (not milky/cloudy) and liquid has thickened a bit. Pour mixture through a fine strainer to remove the bits of peach. You should have a clear-ish liquid (might be a bit yellow) that is just a bit thickened. It should easily pour off of a spoon. Set aside and allow to cool to room temperature, while you finish the rest of the steps. For the Graham Crust: In a medium bowl, stir together the graham cracker crumbs, brown sugar and cinnamon. Pour melted butter over-top and stir to combine. The graham crumbs should be moist, not dry (if so, add a bit more melted butter), but not saturated to the point of being greasy (if so, add a bit more graham cracker crumbs.) Divide the crumbs among the serving dishes, spooning in to bottom of cups and spreading to an even layer (no need to press to compact). You can pop these in the fridge while you make the cheesecake layer. For the Cheesecake Layer: In a large bowl with an electric mixer or in the bowl of a stand mixer fitted with a paddle attachment, beat the cream cheese until smooth. 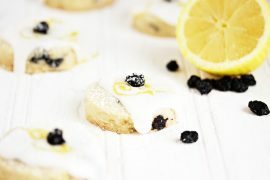 Add icing sugar and mix at lowest speed to incorporate the icing sugar, the beat until smooth. If using a stand mixer, remove cream cheese mixture to another medium-large bowl, clean and dry the mixer bowl and return to stand mixer, fitted with the whisk attachment. Whip cream in clean mixer bowl to stiff peaks. If using an electric mixer, whip cream to stiff peaks in another bowl. Gently fold whipped cream in to cream cheese mixture, until fully combined. Spoon mixture over-tip of graham crumb base, dividing between the 4 serving cups and smoothing the top surface. Be sure to allow room for the top layer, about 1/2 inch clearance at the top. Use a paper towel to clean up the inside edges of the glass cups, if necessary. Pop the cups in to the fridge while you cut the fresh peaches. Cut fresh (unpeeled) peaches in to very thin slices. You'll need 16 slices for each cup. When you have 16 slices, remove one cup from the fridge and position peaches on top as shown in the photos (two slices for one petal, with the cut edges meeting together in the middle). Stir reserved glaze well and check that it is at or close to room temperature. If not, pop it in the fridge for a few minutes. You don't want warm glaze on top of the cream cheese mixture or it will melt in to the glaze. Spoon about 1/4 of the glaze over-top. It should cover the peaches by a bit. Return to the fridge. Repeat with the remaining 3 cups. Allow to chill at least an hour, preferably 2 hours or more. Glaze will firm up as it sits in the fridge. Before serving, arrange a circle of fresh blueberries in the centre, to complete the sunflower pattern. This is SOOOOO delicious!!! Made this tonight as a dessert after some duck breast with blackberry sauce. It was wonderful! Can’t thank you enough for your wonderful recipes! I’ve made so many of them in the recent months, and we have enjoyed everything we’ve had! 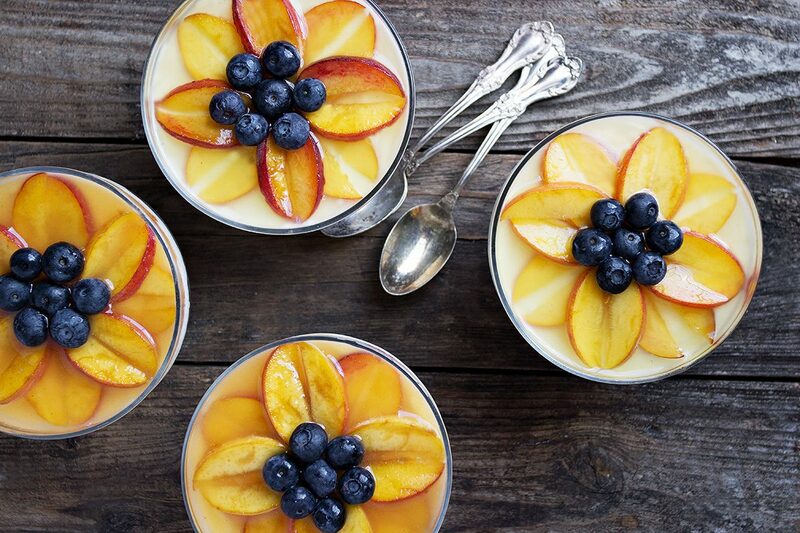 This is the dreamiest dessert, and I love your pretty peach topping! I’m so excited about how aggressive you’re getting with these peach recipes this summer! 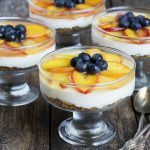 These cheesecake cups look just decadent and perfect for a summer treat (the no bake option is wonderful). I think I like the rosy look, but I haven’t seen it the other way so it’s hard to say for sure. Have a wonderful weekend! Gorgeous pictures of a truly delicious looking dessert! Absolutely stunning! I love your inspiration and the pictures are wonderful. That glaze sounds fascinating and anything no-bake these days is at the top of my list! Wonderful, beautiful dessert – thanks Jennifer! Thanks so much, Tricia and no-bake was a huge bonus right now, for sure :) Have a great weekend! 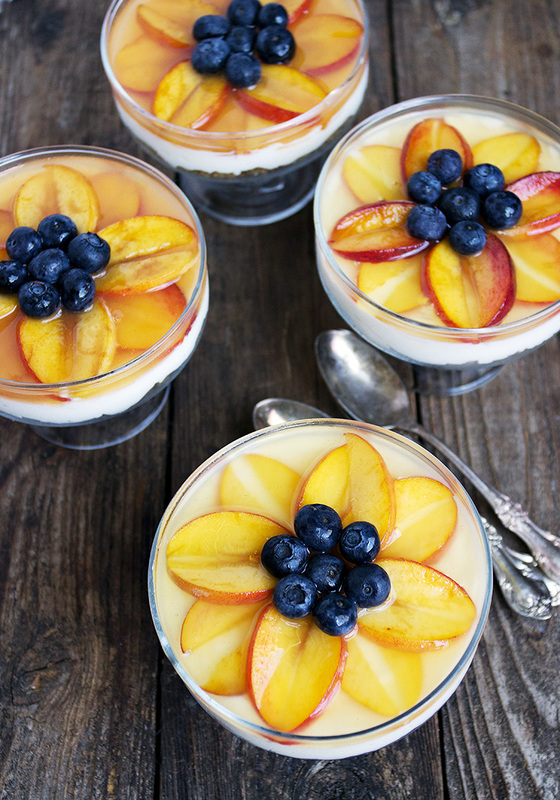 Not only are these gorgeous, but I’m on such a peach kick right now I have to make these. And love that I don’t have to turn the oven on in this heat. Great recipe, can’t wait to try! I love everything about this recipe, but the presentation is stunning!!! Oh my gawsh, these cheesecake cups are the cutest, Jennifer!! Sunflowers are my favorite flower, so the way you decorated these is making me swoon!! And I’m a peach and blueberry fanatic, so the fruit you used is perfect! Plus these beauties are no bake!? I’m blown away! LOVE it! Cheers! This is the prettiest dessert I’ve seen all day! Wonderful job with the presentation Jennifer! They sound totally delicious! What a beautifully layered and presented dessert/dish! 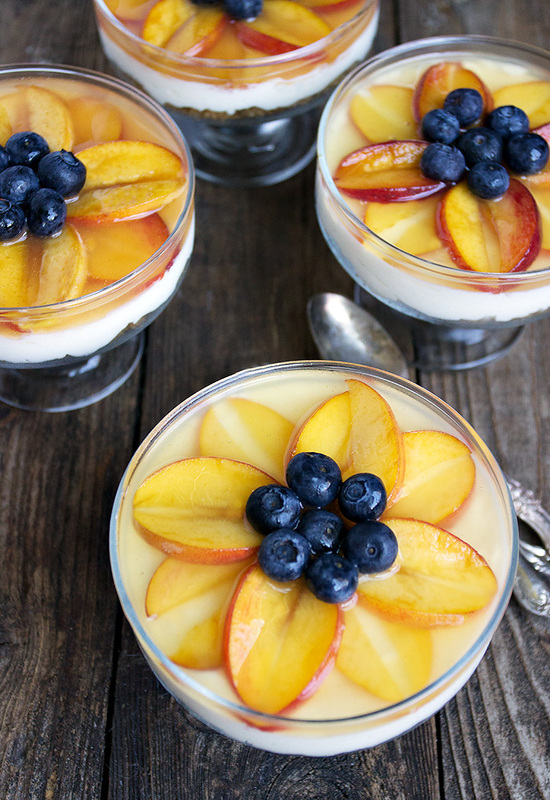 The colors are so vibrant and love how you’ve arranged the peaches and then topped w/the berries. Must be so refreshing and imagining how good it has to taste! Thanks so much, Cristina :) I can assure you they are super delicious and just as pretty in person!